As the New Year is about to knock at our doors soon and is the most special occasion Christmas along with it. We must think of some special preparations that we can make beforehand for the occasions and enjoy this year more than the last one. Here we have some crazy and fun ideas to make DIY party hats for New Year that you haven’t probably thought or heard of before. Use your favorite crafts and supplies for these projects such as glitters, paints, colors, and other basic supplies to achieve your targets. Try making some unique and matchless hats that you and your friends can enjoy wearing and have some fun party time together. Also you can decide for some themes and make your hats accordingly, customized hats are also an option. Fill your New Year eve party with colors, glitters and fun all at once so that you can welcome then New Year with smiles and laughter echoing through your house. Invite your friends over and have fun together. Make use of other usual crafts like pom pom, printable stuff and other items in these projects. Start making your hats without wasting any further time so that all your crafts are ready at the right time. 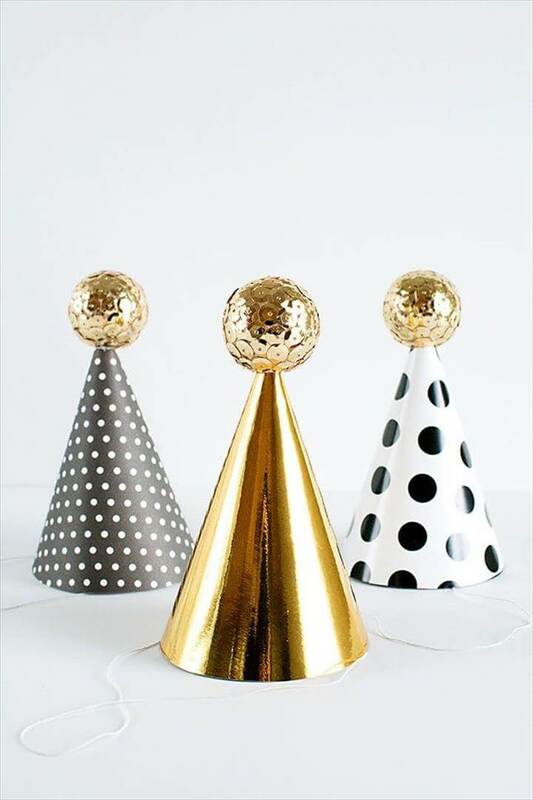 Also share these amazing 50 DIY New Year Party Hats – Quick & Easy Ideas with your friend and family so that they can also make their New Year eve special than ever before. All the projects have tutorials with them in the links given below the projects.